Zippo Lighter Seven Ways Ad 1968 This is a May 17, 1968 advertisement It is a nice color ad from Zippo Mfg.Co of Bradford, Pa. makers of the Zippo cigarette lighter. It pictures seven lighters and it reads, Zippo's 7 beautiful ways to master the gift season, Bon Voyage, Graduation, Fathers Day, Anniversaries, Wedding Parties, Birthdays and Promotions. Each way has its own appropriate lighter. In mint condition. Photo is taken through plastic and may show wrinkles or crookedness that is not in the ad. This magazine tear sheet measures 10"" wide by 13 3/4"" tall. 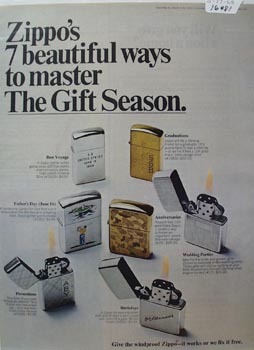 Items Similar To "Zippo Lighter Seven Ways Ad 1968"